Eye on Maoist | United We Blog! Two powerful images were splashed on the front pages of Nepali newspapers over the past week. Lets start with the most recent one- that of the former Maoist combatants- smiling to cameras, holding and kissing their kids with their wives by their side- who have been integrated into the Nepali army as officers. 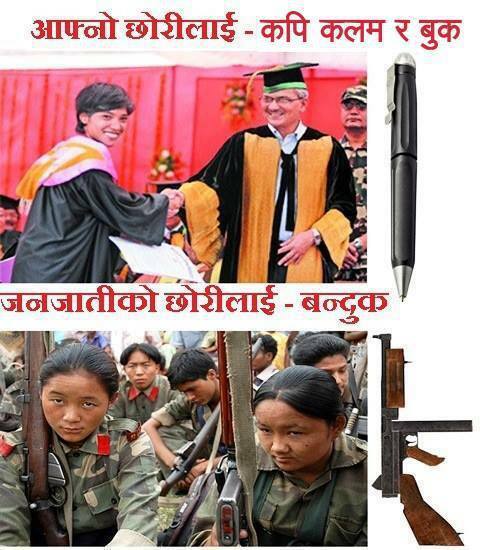 Pen and books for your own daughter while guns for the daughters of poor ethnic people. The context: Election season has started (voting is slated for 19the November). 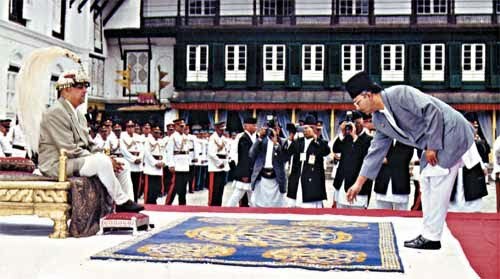 Remember the ‘famous’ Madhav Nepal photo (right)– in which the UML leader is seen offering daam to King Gyanenndra on the latter’s Coronation Day- that the Maoists circulated massively during the 2008 CA elections? But this is not merely an election gimmick of a rival political party. The fact that a UML campaign circulated these pictures doesn’t mean it undermines the credibility of the poignant message that these photos convey. Temple hopping CP Gajurel (You spotted him! Silver-haired and in white kameej) of the Maoist party at the Doleshwor Mahadev temple. 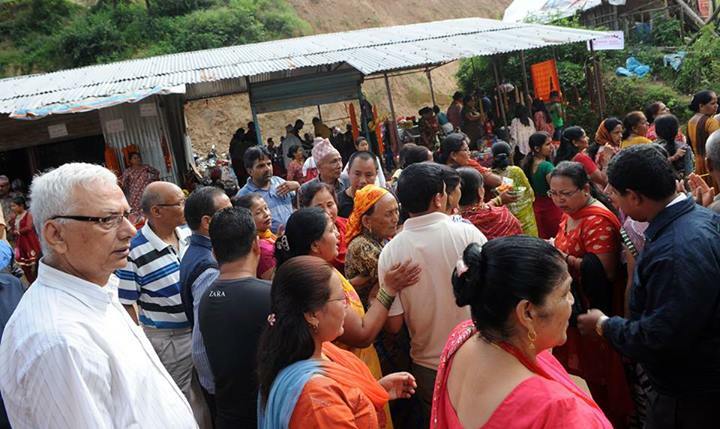 The ‘misleading’ and wrong decision taken by the Special Committee comprising representatives of six political parties has clearly indicated that financial accountability is a far fetched dram for Nepali people. On 12 April, some members of the Special Committee for Supervision, Integration and Rehabilitation of former Maoist combatants which was formed in October 2008 wanted to know how Rs 19.71 billion was spent on the Maoist People’s Liberation Army (PLA) cantonments over the last seven years. According to the Kathmandu Post, Nepali Congress leader Ram Sharan Mahat proposed that the committee passed a proposal directing the government to conduct a special auditing of the expenses. The committee, comprising representatives of six political parties, adopted a resolution with a soft tone, committing that the Office of the Auditor General will conduct a detailed investigation to see whether the funds were spent legally. It also agreed that the financial discipline maintaining body would recommend the government to publicize its report. In textbook of science in high school, we used to read the scientific definition of ‘work’: using a force to move an object to a certain distance. Or, using force is not enough to define work. It seems our leaders have been putting excessive force but no progress in distance front. Their efforts have failed to deliver any results and their relevance in the country’s politics has expired though they think that the country cannot move ahead without them. He did it. He floated the idea of Chief Justice (CJ)-led government for holding elections. Top guns of other political parties admired his idea and followed him in a submissive manner. Leaders of so-called democratic parties even did not discuss the idea within party mechanism. And, even after putting ‘tireless’ effort since the first week of February, they have failed to show the result. Accordingly, CJ Khil Raj Regmi denied to lead the election government citing possible unwarranted pressure from political parties. Neither could they convince the chief justice to form an election government nor could they float any alternative idea to move the country ahead. In fact, top guns of political parties have created a situation of political stagnation putting citizens at the receiving end. Peoples’ hope for political reforms have faced a severe obstacle due to and their decision to give Maoists a try (during Constituent Assembly election in 2008) have gone futile. It has been proved that Maoists are good players of blame-game. During decade-long bloody insurgency, Maoists used to blame ‘expansionist’ and ‘feudalist’ forces including royal palace for wrongdoings and malpractices in politics. And, during CA election, they came down heavily on Nepali Congress (NC) and UML. In rabble rousing speeches, they tried to persuade people saying peoples’ lifestyle would change if monarchy were abolished and a Maoist-led government was established in Nepal. People were told that they could be master of their own destiny and their dream of prosperous life would come true once the Maoists held power. Maoists came into the power and have been holding absolute power for some time now. The question is: where are their promises now? Forgetting insurgency-era promises, all leaders in the party have been doing nothing more than creating an era of political stagnation. First, they forgot the ‘Prachanda Path’ — the brain child of Prachanda — and they also forgot their own promises which were made during decade-long insurgency and they forgot their political consumers, that is, faces of ‘proletariat’. In sum, they forgot the entire political philosophy and ideology based on which they had started decade-long insurgency. They are now a deviated communist party clever enough to betray people. Immediately after their entry into peaceful politics, deputy of UCPN (Maoist) Dr Baburam Bhattarai dubbed CPN (UML) ‘Hing Badheko Talo’ and had claimed that the relevance of CPN (UML) had expired since Maoist was real ‘Hing’. 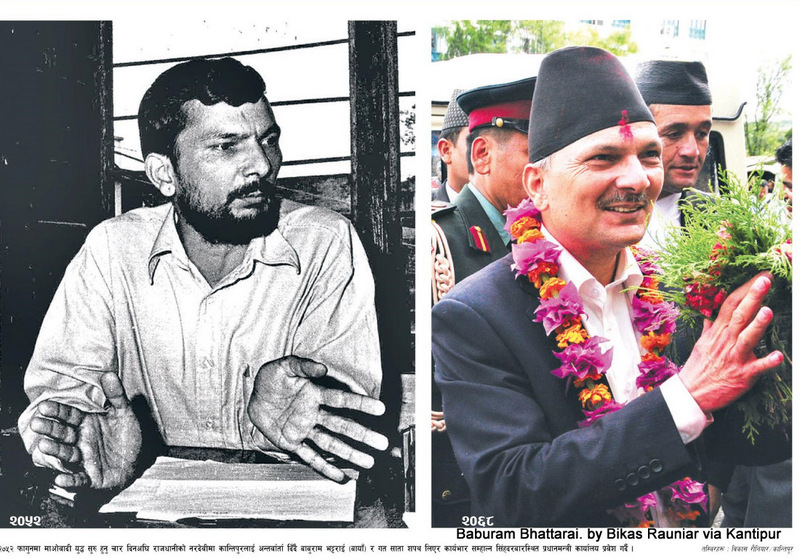 Comrade Bhattarai aka Laldhoj, can you claim your party ‘Hing’ at this point of time? If your party is still ‘Hing’, what about break away faction or Baidhya-led Maoist? It has been proved that Maoists are far ahead in creating catchy jargon to persuade people. It is for sure that they will create dozens of jargon to be sustained in the politics. But, I know they will lead us into nothing than political stagnation and perennial vacuum. Appointment of the SC Chief Justice as the Prime Minister will be Supreme injustice to the people of Nepal. Unfortunately, the Maoists have proved me right yet again with their flabbergasting proposal. You don’t have to be a political scientist to know what the Maoists are trying to do is completely against the basic notion of democracy, that is, the check and balance. And, incompetent and shortsighted opposition parties are once again going to be fooled by the UCPN Maoist. And that will cost Nepal’s fledgling democracy dearly. The propose of appointing incumbent chief justice as the Prime Minister of the country has apparently showed that the largest political party of Nepal is trying to ruin the basis democratic concept ‘check and balance’ among major state organs — judiciary, executive and legislature. If materialized, the Maoist proposal will not only ruin completely the independence of judiciary but also jeopardize the entire justice system of Nepal. On the other hand, it will also help undermine the importance of political parties in Nepal which will have repercussion in the long run. It is for sure that the Maoists want to resume their war-time ‘kangaroo courts’ which they operated in villages in a direct challenge to the existing judicial system. Even after ending armed conflict in 2006, the party had floated the idea of reviving ‘kangaroo courts’ in 2007 in an effort to step up pressure against the then interim government headed by NC leader Girija Prasad Koirala. The Maoists never believed in current judicial system in Nepal. They have constantly argued that this is the one State organ that still represents that feudal, old Nepal. They have constantly flouted Supreme Court decisions. Their senior leaders, including the PM, have every now and then spoken against the judicial system and courts in general. They think, after controlling executive and having had largest number of seats in legislature parliament (dissolved in May 2012), the judiciary is the last bastion that still remained out of their sphere of influence. The fact that the Maoists couldn’t win notable number of seats in the recently held elections of national committee of Nepal Bar Association despite fighting polls against democratic candidates in partnership with the UML-supported lawyers shows their poor presence in judicial sector. And now, suddenly, they have this new-found trust in judiciary! Doesn’t sound plausible at all. Those who have been criticizing and flouting judicial decisions are now suddenly seeing ‘most independent and trustworthy’ person in the head of the same judiciary. And at a time when the SC is already stretched- and is functioning with only around half of dozen judges and can’t fulfill vacant positions because there doesn’t exist a mechanism in the absence of parliament. Some say he used the word ‘truck’, not ‘car’. Whatever. I think, communism does not but communists do. Communists travel in the most luxurious vehicles according to their availability. Nepal’s ruling UCPN (Maoist) is an example how controversial communists can become when they struggle to maintain a balance between their ideology and lifestyle. The party floated new jargon in its just concluded seventh General Convocation, that is, national productivity. Is this concept a major paradigm shift in ideology of UCPN (Maoist)? What is the covert intention of chairman Prachanda? Can Maoists translate concept of national productivity into action? And can they bring about any changes in lives of ‘proletariats’ for whom they claim to be engaging in politics. Surrounded by Pulsar-riding cadres of Young Communist League (YCL) and party leaders who have already elevated themselves to the elite class from the proletariat that they were until recently, and flanked by his Mustang-rider deputy Dr Bhattarai talks about austerity but indeed encourages corruption, nepotism and favoritism in his government, comrade Prachanda announced in the Hetauda Convention that his party will be focusing on national productivity. That announcement didn’t come at a surprise to those who are familiar with inherent nature of UCPN (Maoist) – which is popularly known as ‘cash Maoist’ (as opposed to the dash Maoist, the Mohain Baidya led CPN-Maoist) due to the party’s excessive focus on amassing ‘cash’ through intimidation, forced donation and brazen corruption.